When setting up the lights on Friday in readiness for the festival weekend at Harrogate, I managed to find a corner spot to point the camera from and recorded a bit of a timelapse sequence. I shot it initially just for my own entertainment but I thought others might like to see the copious amounts of head scratching, finger pointing and general wandering around that NERIAC people get up to when they don't realise they are being filmed! Actually, everyone worked extremely hard to set up their respective cinemas, often for many hours without a break and flitting from cinema to cinema to respond to issues or requests for advice from other teams, whilst unaware festival-goers enjoyed the delights of Castle Howard. 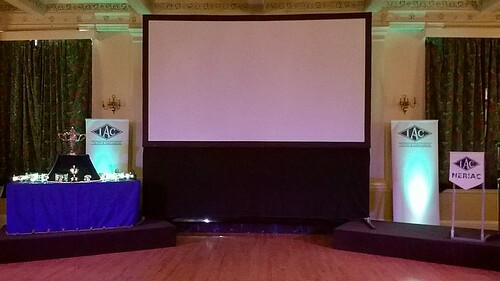 Here is the lighting set up, the sound system being installed and the exhibition screen being erected for the award winner's shows. All the hard work was worth it John. The presentation was excellent. What was with the lighting then? how was it used. The only BIAFFs I've been to have been very straightforward in presentation: Announce a film, show it and if present, the winner presented with his/her award. Don't worry Tim, you didn't miss any late-night disco dancing! The lighting rig was part of the LED rig I have for the band, expanded to include high powered tungsten lights via dimmer packs. Basically the only other option would have been for someone to hide in a cupboard at the side of the ballroom and flick 12 light switches to illuminate the chandeliers and wall lights in between the films, but Derek Mathieson and I managed to come up with a better solution. 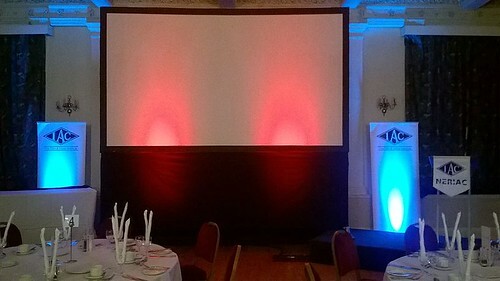 The ballroom was illuminated by reflecting 3200W of tungsten light off the ceiling, and various tungsten and colour-balanced LED lights were used to illuminate the host and presentation area in between the films. All completely automated - I had simply programmed the controller to slowly illuminate or dim the scene at the press of a button. During the intervals I programmed several slow crossfades of colours across the different lights, just to add a bit of 'something.' 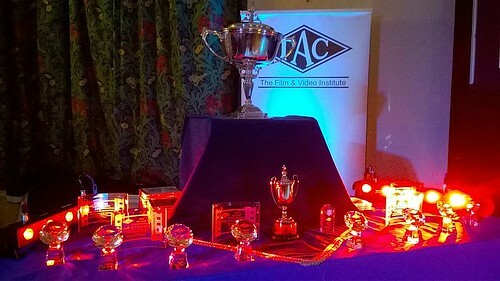 Most people commented on the lights used for the trophies; the 'Diamonds' and glass awards sparkled with back lighting. John Roberts wrote: Don't worry Tim, you didn't miss any late-night disco dancing! It is fortunate that I wasn't there. I have been known after a bottle or so of vin rouge (or a pint and a half of shandy) to attempt to dance, whether or not the Village People are being piped into the room. Strange that i have no problem at all as a muso with even complex time signatures but as a dancer have three left feet. Between my post and your's Jan's write up appeared. Bizarrely this is the first mention of the "presentation". I might have expected other attendees to have commented on it. It's a shame they haven't - but maybe they were all so gobsmacked they didn't know what to say! It looks great John. Adds a bit of pizazz. It's our annual trophy night, we should be screaming it from the rooftops if we want to get others interested and this sort of presentation is a great start. I'm now doubly disappointed I couldn't get there. Well done, John, for raising the bar of presentation. It was a shame you couldn't make it Tim, I'd have loved to have witnessed the dancing, whether it be to Village People or not! However in this age of social networking you might very well have logged into FB to find a highly embarrassing video tagged to yourself and all your friends of friends...! Err, I mentioned John's lighting, along with Michael Gough's presentation and Billy Ellwood's projection in my post on 27th April. I wish I'd said more about it but I think the photos on this thread show more eloquently than words just how good it all looked on the day. Sorry to have to mention one slight negative point but it was mentioned within my hearing that the audio loud speakers were situated too far away from each side of the projection screen. A few people were having trouble in hearing clearly and they thought that the speakers could have been better situated. I'm not sure if this would have helped the hard of hearing but it does seem sensible to get the speakers into a more central position if possible, and, in this case, there was space for this. Otherwise it was all first class and everything went as well, if not better, than other BIAFFs that I remember. An interesting point, Michael! Curiously a few people mentioned to me that it was nice to be able to hear some stereo separation and 'space' in the ambience of the sound tracks for a change! Brian Saberton wrote: Err, I mentioned John's lighting, along with Michael Gough's presentation and Billy Ellwood's projection in my post on 27th April. So you did, Brian! My humble apologies. From where I was sitting, just about halfway back, the sound was first class and, I thought, well balanced between the speakers with excellent setting of bass/treble so that music was punchy but not muffled and dialogue/voice over was crystal clear. Made me wish I'd had a film being shown that day! 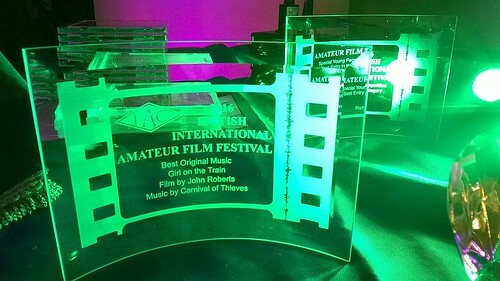 A first class write up on BIAFF from Jan. Thanks for the link to find it.